587 movies in, and I finally saw a movie from 1967! That’s a weird stat. There are a few other years I’m missing. The latest of those years is 1983, which is odd. I have six movies in from 1982 and six in from 1984, but none from 1983. What’s that? You don’t care? Oh. Good point. Here’s the movie ranking for POINT BLANK. I watched POINT BLANK (1967) on 11.9.13. It was my first viewing of the film. According to Turner Classic Movies, Lee Marvin was newly a star with cache (thanks to DIRTY DOZEN). He used that cache to get this movie made with director John Boorman. Marvin fought for Boorman when the studio wanted to go a different direction. It’s an interesting story because Boorman went from being out of a job to making this visually impressive action movie. Would he have gone on to direct such great works as HELL IN THE PACIFIC or DELIVERANCE without having made this? Who knows. But it would have been harder. 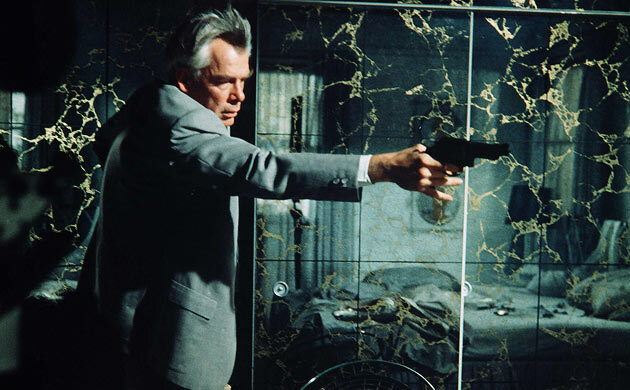 POINT BLANK is action by way of the French New Wave. We know we are not in standard action-movie from the opening scene. Lee Marvin is on the floor of a cell in the closed Alcatraz. We hear the voice of Mavin’s Walker replaying a conversation. Then we start to see the conversation which was running through his head, which happened weeks earlier, then we see the events of the night at Alcatraz unfold. This is all cut together in a non-linear fashion. At times we are listening to Walker’s voice running what was said by his former friend Mal (John Vernon) while also hearing Mal say it himself. It’s jarring. Which, of course, is the point since Boorman is putting us in the same confused and unsettled state as Walker: He has just been shot, he’s just been betrayed by his best friend and his wife, and he’s replaying in his head just how it all could have happened. It’s a marvelous opening scene. One that shows off Boorman’s ability to tell a story in a way which wasn’t particularly prevalent in Hollywood in the 1960s. Of course the French were cutting in the middle of takes and leaving large gaps of space out of their narratives as it suited them. But they weren’t doing it with an action movie which would have otherwise been conventional and, perhaps, underwritten. The particulars of the story are mostly an afterthought here. Walker seeks out revenge on Mal as he seeks out the $93,000 he is owed from the job that went south. We think the money is unimportant, that the betrayal is really what matters. Only the movie reveals this to not be the case. The seemingly obvious climax happens, instead, halfway through. More important men than Mal are to be confronted and dealt with. They all come to work for something called The Organization. The Organization is business and corruption. They deal in… something. But we never find out what because POINT BLANK could care less. To make them the purveyor of something specific would be to give Walker a cause. And Walker is a man with no particular cause. He was wronged, so he should do something about it. This puts him in league with guys like Bogart’s Sam Spade from THE MALTESE FALCON. Spade goes after the guys who killed his partner because he is supposed to, not because he cares. He may find himself attracted to a woman and he’ll certainly sleep with her along the way. But that doesn’t make him softer or compassionate. It merely makes him a man fulfilling a need. Marvin is wonderful to behold in this. He has the persona down. The rest of the cast is good too. Angie Dickinson is surprisingly effective as she plays tough, yet vulnerable, Chris. It was her sister that first married and then betrayed Walker. She likes him. She wants to help him. She doesn’t know just how much she’ll have to do, or she might not have done it in the first place. John Vernon is loathsome as Mal, and that is a good thing. Carroll O’Connor provides some levity as a bad guy. Ditto Michael Strong. There isn’t a weak member of this cast, even if Boorman sometimes has his actors playing so woodenly that they come across as vanilla. But that’s all part of the plan. This is Boorman’s film. No question. The non-linear editing continues. Sexual climax reveals the joy of not just Walker and Chris, but of Walker and his wife. Of Mal and Walker’s wife. Of Mal and Chris. They are all intertwined. Walker and Chris may have been the ones to walk away, but they very well might not have been. Boorman uses gaps in the story effectively. Walker walks into the bedroom to find his wife has overdosed. He approaches a window. Watches someone. We see the apartment is now empty, abandoned. He confronts the person who comes into the home. How much time has passed since his wife’s death? We don’t get a clue. It could be hours, days, weeks. It doesn’t matter to Boorman because it doesn’t matter to Walker. Because to Walker it FEELS like it just happened, so that’s what the audience gets as well. He ignores the normal clues given to us by editing: Establishing shots, shots of a clock, shots of nights and days passing. None of these things are given in this scene because they would undermine the emotional state Walker is in. This belies his outward lack of emotion, it seems. He seems more angry at the passing of his betraying wife than he did at his own betrayal. This is a well scripted movie. Based on a Donald Westlake novel (which was also the source of the Mel Gibson film PAYBACK), there is plenty of noir craftiness built into the plot. The dialogue works, most memorably when Chris asks Walker what her last name is, knowing he doesn’t know. He responds by asking her his first name, which she also doesn’t know. It’s an anonymous and detached world they live in, and it’s a wonderful world in which to set a revenge movie. This was just such a pleasure to behold. It was unique, inspired, and effective. It may not be everyone’s bag, but it sure is mine. I loved the sound design of this film. One memorable moment has Walker moving down a hallway, his footsteps echoing, as this is edited (in non-linear fashion) against his wife preparing for her day. Another involves a fight in a nightclub played against the jazzy vocalizations of the club’s singer. Wonderful stuff.